Last week, I offered training at the middle school of a neighboring town on the current trends in working with LGBT youth. During the course of the evening, we covered the newest stats that the GLSEN National School Climate survey (http://www.glsen.org/sites/default/files/NSCS_ExecSumm_2013_DESIGN_FINAL.pdf) gives us, including the fact that (to the surprise and concern of several parents sitting there), the restroom is viewed as one of the most dangerous places in any school building in the country. As I was speaking, I recalled the comment about criminals, sexual deviants and predators taking advantage of being able to use the restrooms at will, and then I thought, Yeah, but you know who’s NOT using the restroom? Lots of transgender kids! Because they’re scared to pee! I’ll admit to some confusion and a BIG dose of disagreement with the Florida state rep’s reasoning for this Don’t Pee Here bill. Speaking as someone who has been asked to leave numerous women’s restrooms (despite the fact that I was born into and still reside in a female body) by women who mistook me for a guy, I don’t get it. Are we THAT hung up on body parts that people are freaked out to see someone with short hair standing at the sink, washing their hands? Given the times women have stopped dead in their tracks as they walked through the bathroom door, looked at me and then checked the door to make sure they were in the right room, I have to say yes, it appears that some of us are. Well. I don’t know about that. But thank you for offering your approval of my anatomy. Which, by the way, you haven’t actually seen. I’m also not sure what’s the bigger question mark for the women who pile up in the doorway—my short hair, or the fact that I am completely comfortable going to the restroom without three or four other women tagging along! I had an interesting experience to contrast those against, a little while back. I was in a Costco and I needed to use the restroom. I’d had a LOT of coffee. I needed to use the restroom NOW. I set my stuff aside and trudged the three miles to the edge of civilization where most of the big box stores keep their washrooms, only to find the yellow cautionary sign up that the cleaning folks were mopping and didn’t want anyone to use the women’s room right at that moment. It was a different version of Don’t Pee Here! Glancing across the way, I saw there was no such sign in the doorway of the men’s washroom. Should I? Would anyone care? The three guys who were in there were not phased. All three of them looked at me as I rushed past and nodded. At least one even mumbled something along the lines of, “Hey, how you doin’?” No one offered an opinion on my anatomy or presentation thereof or questioned my right to use a restroom as needed. 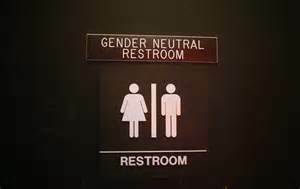 If we can wrap our heads around the idea that for most people, trans and gender expansive people included, restrooms are just a part of the normal course of a day and not an adventure in speed dating or trying to molest anyone, maybe we can stop debating bills like the Don’t Pee Here bill. It’s a matter of need. It’s a matter of what bodies do. Including the bodies of a lot of middle schoolers who are, unfortunately, still attending schools where they’re too scared to pee. More kids are coming out as transgender—and doing so at younger ages– than ever before. More kids are expressing their gender more creatively and refusing to be locked into our existing binaries than ever before. Here’s an absolutely crazy idea. How about a conversation that starts with—rather than Don’t Pee Here—the idea (based on the guy who greeted me in the Costco men’s room with, “Hey, how you doin’?”) that You’re Okay and It’s Safe to Pee Here? Personally, I’m afraid the bathroom wars are probably just beginning. Having finished my transition years ago, I have never had any problems whatsoever so far as using public restrooms; but, lately, I have to admit I’m becoming slightly tense at the thought of having to pee when I’m not at home. It’s scary. Most likely, what will happen is the more advanced parts of North America will adopt a public toilet scheme like that in Western Europe. The toilet facilities are shared among the sexes, with private stalls for each individual to do his or her business in private. It makes far more sense, and it’s probably the best arrangement and “compromise” overall. I’d rather people just get over their ignorance regarding trans*, but I’m not going to hold my breath for that. Agreed, Paige! I think we’re just beginning. I’m hopeful that it’s an indicator of the changing tides that more schools are having this conversation out of concern for their students’ safety in the area of the country where I work, but there are so many other places where gender expansive kids are at danger simply for being themselves! Thanks for taking a moment to drop a note with your thoughts! My 15 year granddaughter is in the process of becoming transgender male. We were discussing the bathroom issue which he is upset about. I told him to give it some time and hopefully people will get it thru their heads to do something like they did with the family bathrooms. I enjoy your posts as they help me to understand my granddaughters decision and to help him any way that I can. Thanks again……. Holly, if there’s anything I can do to help, just let me know!